Size: 7.2" x 5.0" x 1.6"
Compared with the later "Cheapos" this TI-5112 feels very strong and solid. It features everything you need for the daily use on your desktop. 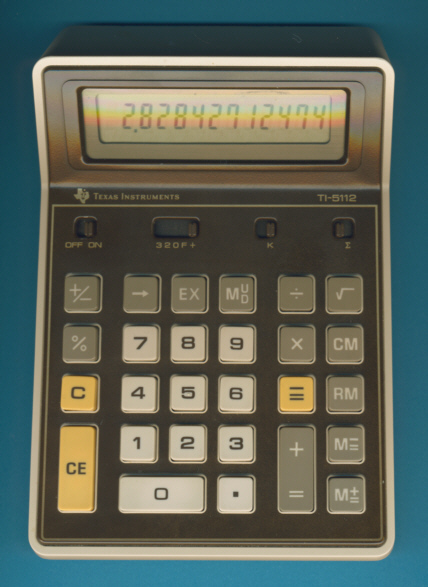 A cheaper model was available almost three years later as TI-5020 and it took another year and the TI-5100 II upgraded the LC-Display to a green fluorescent display. Dismantling the TI-5112 reveals a clean design based on the Toshiba T6736S single-chip calculator circuit but hides the true manufacturer of the calculator. We suspect Toshiba based on the layout and appearance of the printed circuit board (PCB) but can't proof it.